Purchase Manager Tools Now Available! Broadcasters, you can now view the Pay-Per-View and Pay-Per-Download purchases made by your fans more easily than ever! Available now on vCloud is the ability to view purchases for all of your broadcasts. If you do currently have Pay-Per-View or Pay-Per-Download enabled on your site, you can go to your Admin page on vCloud, then click Site Purchase History underneath Reports. Once you’ve clicked this, you will be taken to the Purchase History page. 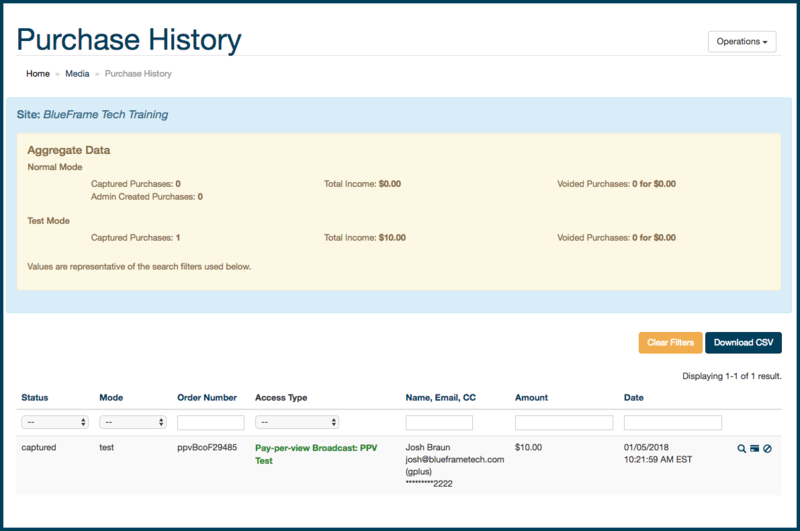 The Purchase History page by default shows all of your purchases, but it can be sorted and filtered by status, mode, order number, access type, name, email, amount, and date. There is also a Download CSV option available, which will allow you to download a spreadsheet of your filtered (or unfiltered) purchases. You also have the ability to view individual broadcast purchase information, by going to either the Manage Broadcasts or Broadcast Grid page and selecting the dollar sign next to the broadcast. This will bring up a Purchase History page for that individual broadcast. If you have any questions about our purchase manager tools, please let our team know.